People walk around trains or emerge at around 5pm on carts selling Bhel Puri as a snack. The combination of spices, fried carbs and fresh coriander/ tomato is so addictive. The beauty is that you can make it as described below, which clearly shows how much effort and ingredients goes into even the most daily Indian snack. As a fast alternative you can also avoid and leave out everything except the fresh ingredients and tamarind chutney and then add these to a bombay mix variety that contains puffed rice (this is essential). By adding a few of your own spices you can make an incredible and impressive Indian dish as you can see below! This is a complex “salad” that has numerous of different parts that are brought together when desired and mixed together vigorously. Mix it together and eat immediately to ensure it doesn’t go soggy. The following is how you can make Nimkis fresh. Although they are a little bit of work they are delicious to eat as snacks on their own right. You can also buy Nimkis or also puris from Indian shops if you cannot be bothered to buy the ingredients or make them. Seive flour into a bowl with the spice and salt. Add the oil and rub the flour between your palms until it takes the form of breadcrumbs,so that the oil coats the flour well. Add the warm water a little at a time,bringing the mixture together before kneading into a firm dough. Cover with a wet teatowel and set aside for a atleast 20 minutes. Form the dough into golf ball sized balls. Roll into even circles ½ cm thick. Prick each with a fork and set to one side to dry out for 1 hour on kitchen paper. Over a medium heat add the oil to a frying pan. Fry as many Nimkis as possible without them touching each other for 5- 7 minutes flipping each once ensuring both sides are a light golden brown. Leave to cool. The beautiful thing about Tamarind chutney is that it can be used in so many ways and can be stored in suitable (sterilised) jars and in the freezer, for later use in Indian or Asian dishes. Add the sugar to a small dish and add the lemon juice. Stir until the sugar dissolves. Stir in the spices and then the tamarind paste. Add a little water if necessary to ensure a consistency of thick cream. Leave to one side. Boil the potatoes until soft, drain and mash well with the chili, ginger and coriander (keep a little coriander back as a garnish). Break the Nimkis into small pieces into the potato, before adding the bombay mix and puffed rice. Mix this together thoroughly with the spices, lime juice, onion and tomato. 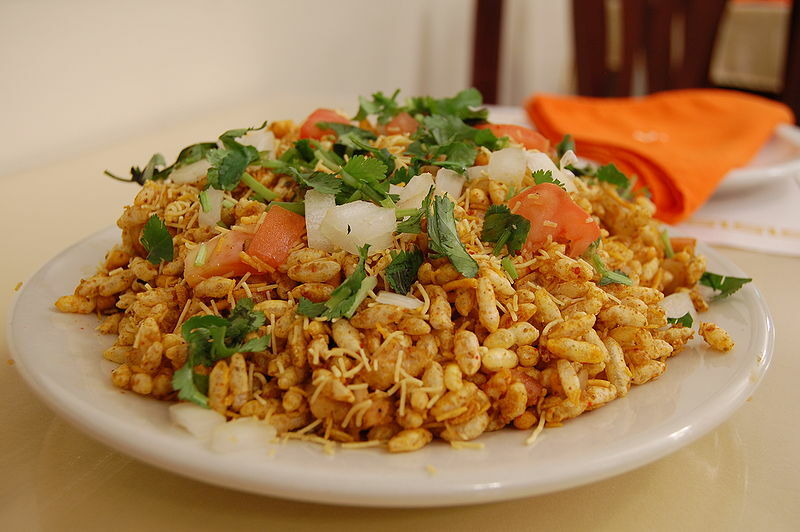 To serve mix around 1 tbsp of tamarind chutney into the Bhel Puri in a separate, smaller bowl before transferring onto a small plate with a sprinkle of the leftover coriander. Yummy! A great pre-dinner snack with cold beer. Have you heard of the Indian classic beers like “Cannon 2000” or “Hit”? You don’t forget them- trust me!